It’s been very hot here in Greece and that is why it was a little like the torment of Tantalus to see merry clouds hovering above Turkey. In daytime they expanded into huge and impressive cauliflowers and at sunset they turned to gold. At night, with our temperature still not below 30 oC, the clouds were illuminated by a fascinating light show started by orange flashes of lightning that played a game with the clouds. The bolts flashed out of the clouds, and made the cauliflower transparent or coloured its edges bright orange. We had the lightshow, but not the rain or any cooling off, because showers that were forecast did not fall on the island. I only could imagine how far into the land mass of Turkey people were embracing the rain and totally refreshed by it — enough to sleep in their beds — while here even a swim in the sea wouldn’t cool you down. The sea was as hot as the water in your bath tub! The flashes of lightning raised our hopes, but, sadly, we cannot complain about an absence of fire on the island. Some weeks ago the wild fires at Molyvos started again and just as they were at the end of last summer they were deliberately kindled. The inhabitants of Mollywood, the region where most fires started, had more sleepless nights and angry residents called for action and formed civil fire-watcher teams. When there is danger rumours fly around in the village. Last year they were about a group of boys who were supposedly caught taken red handed kindling a fire, although nobody could or wanted to confirm what was really only gossip. The boys were arrested and the grapevine was very busy about who they were, but they were released and afterwards nobody could or wanted to confirm that this group of teenagers was indeed responsible for all the fires that raged last summer. The only fact is that since that time the fires last year stopped. Last week a huge blaze started outside Kaloni, the biggest fire on the island since 2006 and it threatened several places: one fire front moved to Agia Paraskevi and another towards Klapados. The local firemen, together with helicopters from Chios, Samos and Thessaloniki all fought for 24 hours against this terrible fire, but 600 hectares of wood and agricultural areas went up in flames. When you drive now from Kaloni to Petra you not only see the charcoaled area, but smell it as well. The rumours about the cause followed pretty quickly. Some said it was started by Turks — a favourite accusation from Greeks. Others said it was last year’s arsonist from Molyvos. In the papers there was talk about sparks from the armoured cars of the army driving around near where the fire started. The only fact is that the investigations into it are still underway. Around Athens the causes of fires has more than once been connected to the bad behaviour of the real estate industry, but here on Lesvos nobody can profit from a burned out area. Unless, like in Molyvos, you have an arsonist, fires here on Lesvos are mostly accidents, caused by matches or cigarette buts thrown out of car windows, fires that start on illegal dumps or sparks made by machines. 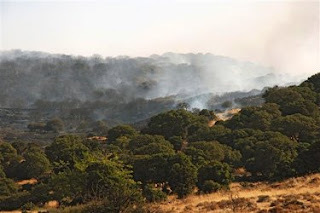 According to a study by the University of the Aegean the wild fires in 2004 on Lesvos were all caused by humans. At the Department of Natural Disasters in Mytilini (the university has departments spread through the islands Lesvos, Samos, Chios, Rhodos, Syros and Lemnos) several studies of fire behaviour and prevention have been made together with research into the development of equipment to prevent, forecast or detect wild fires. However even the best systems, connected to the latest communications technology could not prevent the huge Kalloni catastrophe. Even though there is plenty of publicity and public messages about how to avoid throwing cigarettes out of car windows, burning garbage illegally and the rest, people still carelessly do these things and so the wild fires start. In Molyvos they have tried to put their own ‘prevention measure’ in place. When the fires started again in June this year again, lots of people thought it was a man in the village. Last year it was said that it was he who encouraged kids to start the fires and when a bunch of angry villagers tried to confront him, he fled on his motorbike. After some more fires the villagers took matters into their own hands and refused to sell him bread, no shop would serve him and he couldn’t get a meal in a café or restaurant. The man fled to Kaloni and since then there are no more fires in Molyvos. But the people in Kaloni must be wondering!